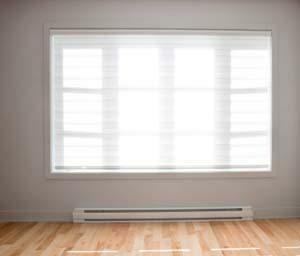 Baseboard hot water heating systems are the most common types of hot water heating in American homes. This type of heating is known as hydronic heat. A baseboard hot water system features finned-tube emitters located close to the floor, covered by a metal housing enclosure. The metal fins surround the copper tubing through which the hot water flows, absorbing the heat from the copper and radiating it upward and into the room. The housing has a reflective material inside that boosts heat transfer from the fins to the air that passes over them. The material is positioned at the back side of the heater to prevent the warm air from being absorbed into the cold wall behind it. Each individual fin acts as its own heat emitter. One of the greatest misconceptions about baseboard hot water heating systems is that the enclosure is installed directly on top of the floor when it really shouldn't be. For the heater to work effectively, the pipe and fins must be installed at least one or two inches above the finished floor so sufficient air can flow through for maximum heat transfer. If the pipes are installed tight to the floor, air will not be able to flow through and the heating results will be inefficient. In hydronic heat, the water is heated by a boiler which is fueled by either natural gas, propane, oil or electricity, and pushed through the system of pipes by a pump or circulator. The water usually leaves the boiler at a temperature of approximately 200 degrees. As the water travels through the system, it transmits its heat and eventually returns to the boiler to be reheated and redistributed. The water returns to the boiler much cooler, typically around 150 degrees. Traditionally, one of the biggest drawbacks of baseboard hot water heat has been the inability to control the temperature in select areas of the home, but with high-end systems that is no longer a problem. Modern systems are multi-zoned which incorporate branch circuits that operate as loops off the main system. When heat is called for in one zone but not the other, the lines that feed the non-heat zone are bypassed and only the zone that's calling for heat receives the hot water. Depending on the size of the installation, a circulator pump may be installed on each branch loop. This helps prevent the main pump from kicking on every time a zone calls for heat. Leaks in the system - Leaks are easily distinguishable because the floor below the leak will be wet. Pump failure - When a circulating pump fails it is usually due to the bearings wearing out. When this happens, the pump will make a lot of noise when it runs. The pump is also prone to developing leaks when its seals start to wear. Boiler failure - Boilers can develop leaks just like hot water tanks, but because these systems are enclosed without new water constantly being brought in, the likelihood of this happening is reduced because there is no calcium build up like there is in a hot water tank. Air in the pipes - If you hear gurgling noises in your hot water heating system, then air is trapped in the pipes. The system should have a tire valve somewhere near its high point where air can be bled from the pipes. Dirty radiator units - Even though the fins are covered by the enclosure, dust will still accumulate in and around them. In order to maintain the efficiency of the heat, the fins should be vacuumed on a routine basis. Hydronic heating is fast becoming a popular choice in new homes, but baseboard hot water heating is not the preferred method in the modern home. These days, in-floor radiant heating is what's hot as it allows heat to radiate up into the entire room from the ground level. This type of hot water heating still follows the basic principles of baseboard hydronic heat, taking it to the next stage of its evolution.